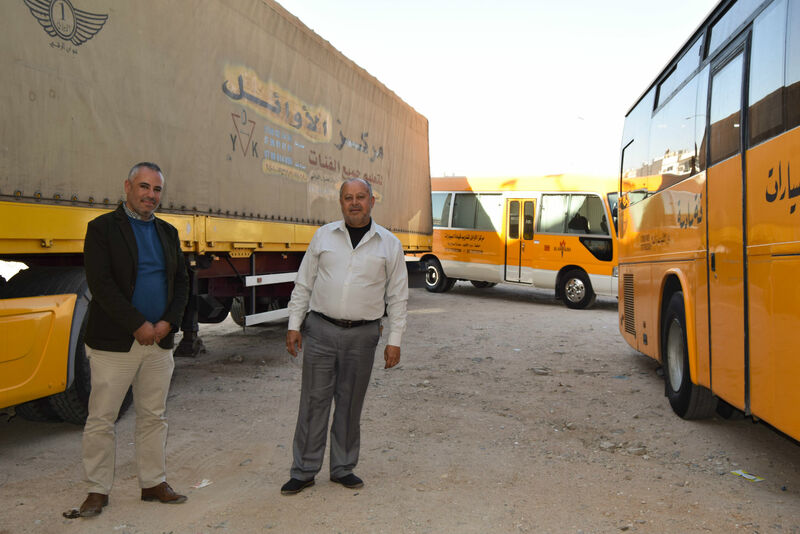 Truck drivers in the south of Jordan provide an essential service to the industrialized cities by transporting goods and raw materials to and from the Aqaba port, the Saudi border, as well as manufacturing plants and distribution centers. However, getting a truck driver’s license in the south is a common struggle faced among drivers due to the unavailability of a certified training vehicle. This means that drivers living in the south of Jordan must travel to Amman, often more than once to take the driving test, which imposes high costs on the drivers, until Rami Sawalha stepped in back in 2013. In Arabic, Al-Awa’el means to be first; a word which Rami chose as the name of his driving center in Aqaba, and has managed to live up to in almost everything he has done. He was the youngest person to ever open a driving school in Jordan. His center was the first in the south to offer truck driving courses. He was the highest achieving student in the first formal driving instructor training he took at the Royal Automobile Club Training Center. He also employs the first female driving instructor in the south. “I spent months in the back seat of other driving instructors’ cars trying to learn new things from them while they gave lessons” Rami recalled. Aqaba 14 January 2018, Rami sits in the South's first truck for driving training, which belongs to his center. After graduating from school and successfully obtaining all categories of a driver’s license, Rami’s journey as a driving instructor began. He bought two cars and operated them at different driving centers, but at the age of 29, his ambition pushed him to stop working for others and open his own driving center. His ultimate vision was to be involved in advancing the transport sector in Jordan and raising awareness on the best practices in the field among drivers, an initiative which the USAID Jordan Local Enterprise Support Project (LENS) started working on in 2015. The instability in neighboring countries has imposed numerous hurdles to the transport sector in Jordan, such as closing many regional markets including the northern and eastern borders, Libya, and Yemen. Truckers have also been facing many challenges in recent years as individually-owned trucks that are not registered as businesses or do not operate as part of registered companies make up 70% of the overall number of trucks in Jordan. Operating informally limits their ability to respond to big transactions, and leaves truckers with little legal rights and no formal, binding contracts. On the other hand, registered truck-owners also face a lot of problems due to their inability to meet international standards and good professional practices, which reduces their chances of winning contracts or accessing other international markets. Aqaba 14 January 2018, Rami standing in the parking lot near his center surrounded by his different vehicles for driving training. In partnership with the Land Transport Regulatory Commission, USAID LENS supported the creation of a national Training of Trainers (TOT) program which targeted driving instructors from across the kingdom. Over 140 representatives from 90 driving centers, all of which are micro and small enterprises (MSEs) took the “Training of MSEs in the Land Transportation Sector” TOT program. After that, several driving centers were selected on a tender-basis to transfer the same knowledge they have gained from the training, to drivers in their area. Rami’s center was among the selected ones. The program was designed to provide thousands of truck drivers a five-month window to attend the training program at no cost with a special focus on the most vulnerable of truckers. The LTRC-certified training also enables Jordan’s transport MSEs to access European markets easily at lower costs by meeting the requirements that were previously only being met by large shipping companies. “What also differentiates the program” Rami adds, “is that it deals with operators as business owners not only as drivers, meaning that it also stresses on the importance of professionalism in the industry, as well as time and management skills “. As the nation-wide training continues, 5,000 truck drivers and operators from all over Jordan have benefitted from the program so far, with noticeable changes in revenue and an improvement in the overall quality of services. Rami’s center alone has trained over 250 drivers operating all types of vehicles, with a focus on truck and bus driver, since the launch of the training program in 2017. “Having worked in the field for 27 years and as the first female driving instructor in Aqaba, I can easily say that Rami is one of the best driving center managers I’ve ever met” said Um Elias who has been working with Rami for the past nine years. “He has a duty towards ensuring the safety of roads and vehicles, and he wants to give more work opportunities to female instructors which is something you rarely see in the south”. Aqaba 14 January 2018, Um Elias, the first female driving instructor in the south of Jordan, during her lesson with a student. As Rami and 20 other driving centers from across Jordan continue to train drivers as part of the initiative launched by the LTRC and USAID LENS, he says that having the opportunity to give this training has benefitted him in ways that far exceeded his expectations. “Apart from the fact that I’m part of this first-of-its-kind initiative that aims to help all kinds of drivers understand the responsibility they have, I’m also expanding my work through creating new linkages from the program” said Rami. “I’ve had many training participants come to my center to upgrade their driver’s license after meeting me at the training, which means I’ve managed to find a new marketing channel in the least expected setting. There’s always a way to expand your business, you just have to work hard all the time”.